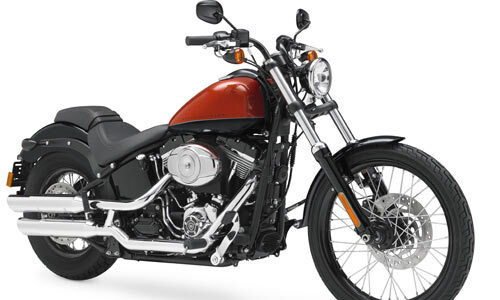 We are fans of Harley Davidson, and we like the look of this new model. But let’s be honest. There is nothing that strikes us as particularly ground-breaking here. Of course, that’s what we’ve come to know and love from The Motor Company. One thing that did jump out at us is the “internally-wired handlebars.” As someone who’s done my own custom handlebar work (using only a drill and a Dremel) to clean up the aesthetically messy wiring situation by running the wires through the bars, I do applaud Harley for taking the cue and making this a stock feature on the new Blackline. Doing it myself was awfully hard work for a motorcycle accident lawyer who is far more skilled in a courtroom than he is working power tools. No joke. That said, the bars mount “directly to the triple tree,” and from looking at the picture, this may make swapping your bars for something custom a little pricier. Without a closer look at the bike, we can’t be sure. MILWAUKEE (January 21, 2011) Lean as wire, hard as iron and dark as a tar road at midnight, the new Blackline motorcycle is a Harley-Davidson Softail model pared to the bone. A rebellious creation of the Dark Custom movement, the Blackline celebrates three fundamental elements of motorcycling: mechanical beauty, internal combustion, and the long black line of the road ahead. The Blackline balances allegiance with rebellion, discarding previous conventions of color and chrome for a Dark Custom look that’s honest, functional and attainable. Visual elements of the original bobber movement are combined with the raw, hand-hewn style embraced by today’s young builders. The Blackline throws new fuel on a fire that burns across generations, an unquenchable desire to ride. The rear fender is bobbed high-and-tight over a slim, 144mm tire that emphasizes an authentic hardtail profile. The compact headlight and speedometer are tucked low into the wide, FX front end, and there’s just enough shine to make the black parts look blacker. Black-rimmed laced wheels complete a look that’s tough, tempered and undeniably Harley-Davidson. The styling spotlight shines on a Big Twin engine dressed in black and silver, and on a fuel tank shaved smooth and low. Aboard the Blackline, the rider hugs the frame on the lowest two-up seat ever offered by Harley-Davidson, and reaches high for new Split Drag™ handlebars that bolt right to the top triple-clamp. The Softail chassis utilizes rear suspension control provided by coil-over shock absorbers mounted horizontally along the frame rails below the powertrain, where they are out of sight. So while the swingarm section replicates the lines of a vintage hardtail frame, the Blackline delivers suspension performance and handling that are thoroughly modern. The internally counter-balanced Twin Cam 96B™ engine is rigid-mounted within the frame, creating a solid connection between rider and the power that moves the motorcycle to enhance the emotional experience of riding. Powertrain is finished in gloss black powdercoat on the rocker box covers, the crankcase, the outer primary cover, and the transmission side cover. The cylinders are silver powdercoat with machined highlights. The derby cover and timing covers are chromed. Rigid-mounted, counter-balanced Twin Cam 96B™ V-Twin engine with Electronic Sequential Port Fuel Injection (ESPFI), rated at 89 ft. lbs. peak torque at 3250 rpm. New round air cleaner cover in brilliant chrome. New Black Denim powdercoat frame and swingarm. New Profile Laced Aluminum wheels with black anodized rims. Front wheel is 21 x 2.15 inches; rear wheel is 16 x 3 inches. Dunlop® D402 tires are MH90-21 front and MU85B16 rear. New FX front end with black powdercoat triple clamps and black painted fork lowers. New Split Drag™ internally-wired handlebars mount directly to the top triple clamp. New Asymmetric five-gallon Softail fuel tank is clean on the left side, with a low-profile fuel fill on the right. Die cast “Blackline” trim panel flowing down the center of the tank is just high enough to cover the fuel pump hardware. New Analog speedometer on a triple-clamp mount that also holds indicator lights. LCD screen on the speedometer includes low-fuel warning and “miles to empty” display function. New Bobbed rear fender with combination stop/tail/turn lights in black housings, and a new composite license plate holder and light module that mounts on the lower edge of the fender. New Raw forged rear fender supports are finished in Black Denim powdercoat. New One-piece, two-up seat and passenger pillion. Laden rider seat height is 24 inches, the lowest two-up seat offered by Harley-Davidson. Gap between the nose of seat and fuel tank exposes the top of the frame. New headlamp in gloss black shell.